Is it foe or is it friend? The great egg debate persists. They say eggs are bad for the heart and have been the subject of criticism and scrutiny for the last few decades. A more recent probe though suggests that this versatile food, the ultimate fast food, has moved from health hazard to dietary recommendation. No food has had more high and lows for over a decade than the common egg. It is blamed as the culprit for heart disease and strokes, they now say that, yes it does increase cholesterol levels but studies also show that an egg a day for healthy men and women is unlikely to have any real change in heart disease and stroke risk. I happen to enjoy, no make that—love eggs—who doesn’t? It ranks close if not equal to butter on my list. It is an essential staple that saved many a hard-pressed, lackadaisical night. But on the flip side, it also is muse to many ingenious dishes. Preheat broiler for 5 minutes and place the oven rack 6 inches below the heat. 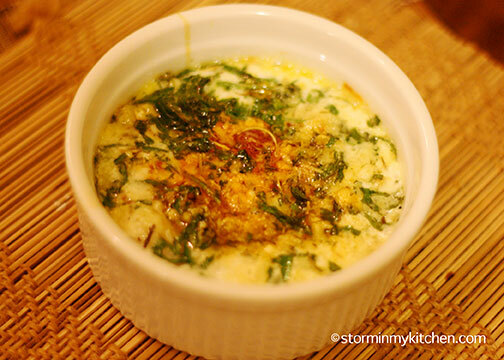 Combine garlic, herbs, & Parmesan cheese in a small bowl. Set aside. Carefully crack 2 eggs into small bowls, making sure that the yolk is intact. Place 2 individual ramekins on a baking sheet. Place 1 tablespoon of cream and ½ teaspoon of butter in each dish and place under the broiler for about 3 minutes, until hot and bubbly. 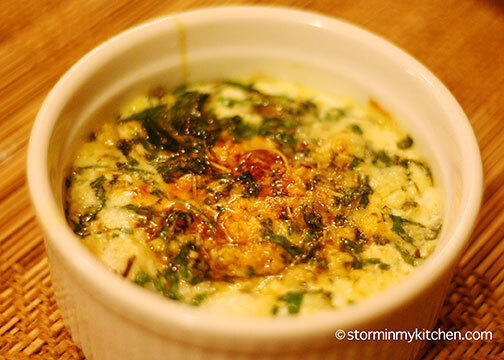 Quickly pour 2 eggs into each ramekin and sprinkle evenly with the herb mixture. Season with salt and pepper. 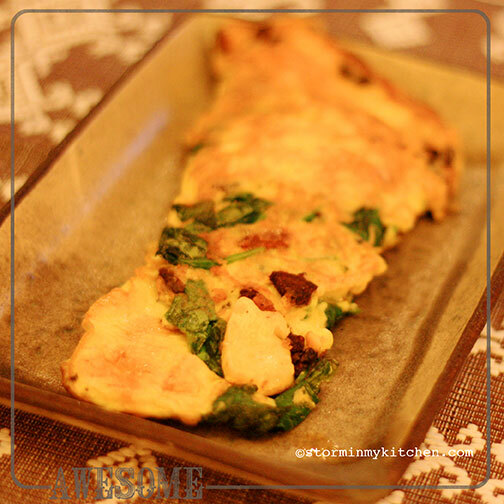 Place back under the broiler for 5-6 minutes or until white of the eggs are almost cooked. The eggs will continue to cook after it is taken out of the oven. Cool for a minute and serve hot with toasted bread. I had this for lunch, but it can be a great kick-start to the day. If fresh herbs are a problem, dried herbs work well too. Reduce them to at least half the amount and you will also get wonderful results. My take on this persisting debate: Eggs are an important source of high quality protein, it is packed with essential nutrients, and a good source of omega 3. The highest source of protein is in the yolk, they say. I say the highest source of flavor is in the yolk. So missing out on the yolk means missing out on the best benefits this tiny piece of heaven has to offer. And besides, egg whites are really meant for macaroons, yes? Sick during the holidays – how sad is that? A week after and I am still nursing a bad cough, nose still pretty clogged. I have so much food from the holidays but appetite eludes me. So, I ended up with more food than ever before. I bet the people at reception, maintenance, even the guards won’t ever forget me – either they love me to pieces for all the holiday goodies I brought their way or they are avoiding me by now for dumping so much food on them. I trekked to the doctor’s clinic last week. “I need to be well by Saturday”, I told him. And like a good doctor that he is, I am feeling better now, thank you, although I am still not in creative cooking mode. Until last night, when I whipped up a pleasant meal of leftovers, which I ate with gusto – and that is a wonderful sign that I am on the road to real recovery. I had some fresh mozzarella that needed to be consumed soon, what to do? I didn’t feel like a pizza or a sandwich. I didn’t have fresh basil and tomatoes so a salad is out too. Besides, I wanted something more filling – a first in weeks! So, I beat to combine a couple of eggs and a couple of tablespoons of milk. Sliced the mozzarella. Washed some leftover spinach my mom sent my way before she left for abroad. Threw some bacon bits on the pan – I always have bacon, no mater what!! Then I threw in the spinach, seasoned with salt and pepper. 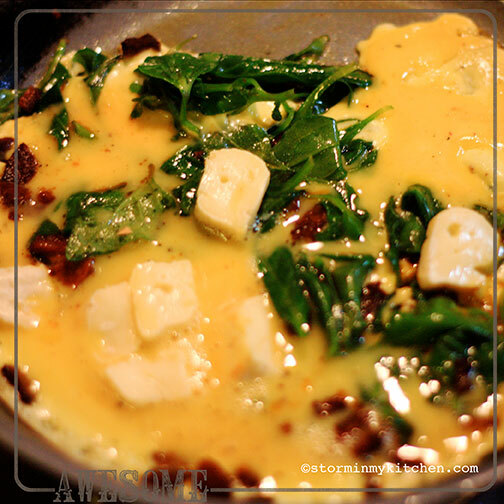 Poured the egg mixture into the pan as soon as the spinach starts to wilt. Before turning over, I added the mozzarella cubes. It’s smoky with a mild cheesy taste. I think it’s awesome. A very belated New Year greetings to everyone. May you cook more and eat more healthily, be blessed with more opportunities to try new foods and flavors this year. I, however, love breakfast and no matter how late I wake up, I hardly skip it. 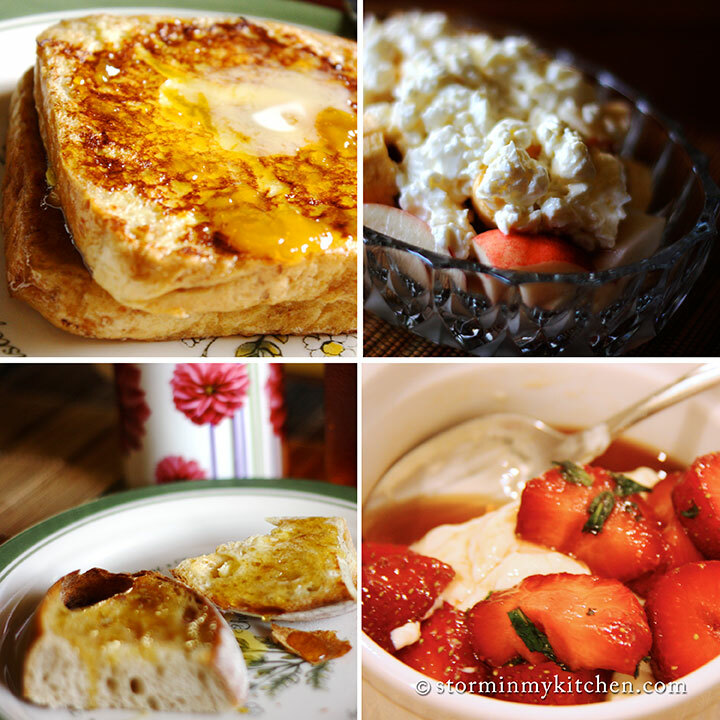 On weekdays, I usually have something simple like jam and butter on bread, granola with either milk or yogurt or just yogurt and some fruit – anything that is fast and easy because I’m always late. Now, breakfast on weekends is a different story. It usually is more special, grander, prepared with more love and attention. Eggs are usually reserved for the weekend and I am, at the moment, enchanted with Paprika on eggs. Not any kind of paprika, mind you. Although a staple in my spice rack, Paprika was only meant to add color to chicken, stews, potatoes… until Pimentón de la Vera came into my life, that is. Smoked Paprika from the Tietar River valley in La Vera, Spain changed my concept of Paprika forever. It is the precious spice used in Spanish chorizo distinctly known for its amazing smoky flavor and aroma. 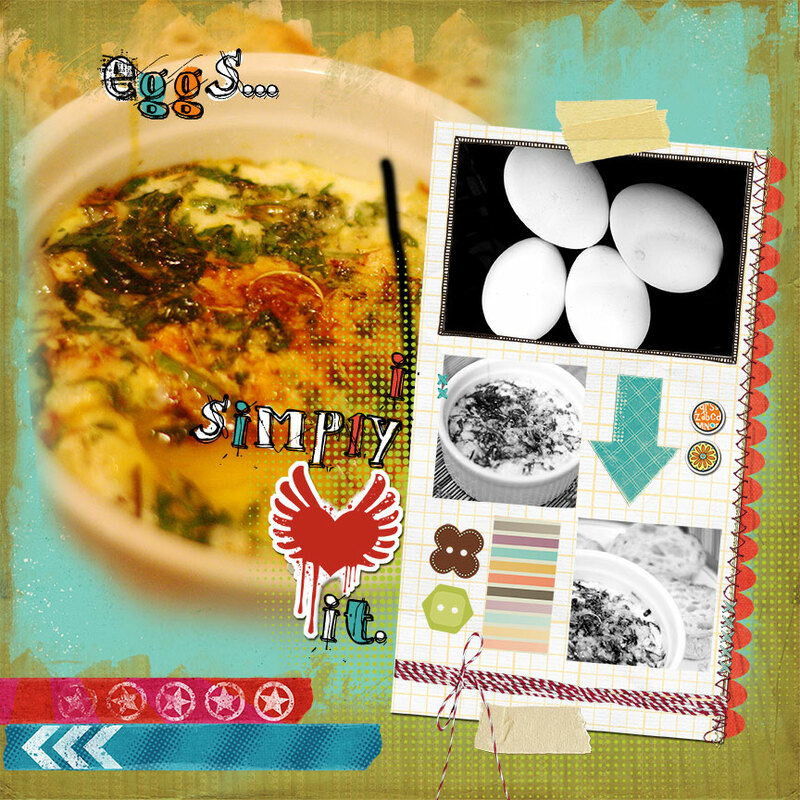 I am loving it in anything and everything, but most especially on eggs. They come in 3 variants – dulce (sweet and mild), agridulce (bittersweet and med hot), and picante (hot). The slightly sweet smokiness of my favorite variant, dulce, perks up the flavor of the eggs. 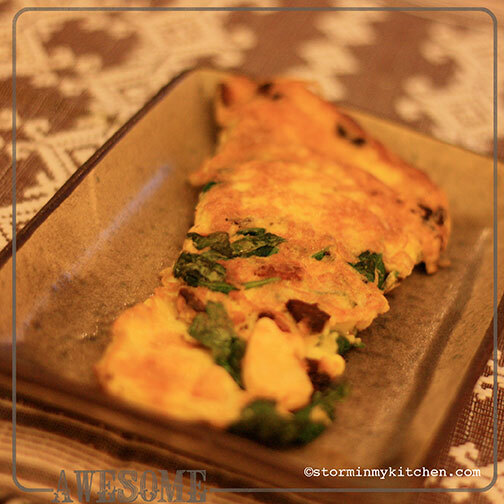 Makes me excited to wake up in the morning… hmmm, maybe I should try making this on weekdays? Preheat broiler for 5 minutes and place oven rack 6 inches below the heat. Crack eggs without breaking the yolks on a small bowl. Set aside. 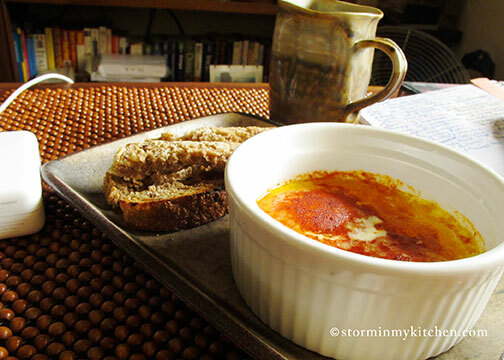 Place cream and butter on a ramekin dish and place under the broiler for about 3 minutes or until hot and bubbly. 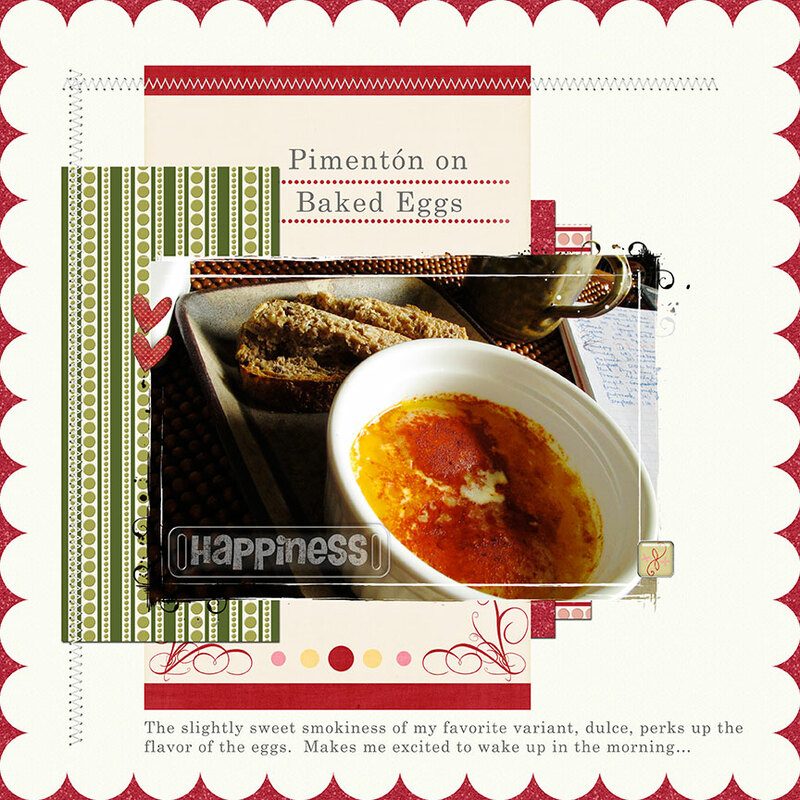 Quickly pour the eggs into the ramekin dish and sprinkle with salt, pepper and the a few dashes of pimentón. Return under the broiler for 5-6 minutes or until the whites of the eggs are almost cooked. 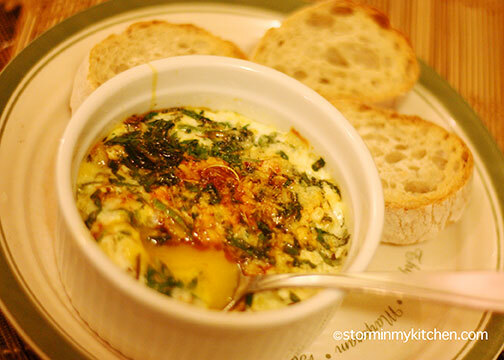 The eggs will continue to cook after taken out of the oven. You are currently browsing the Eggs category at Storm In My Kitchen.